What have you been up to this week? We’ve been busy shooting the final sections of my book (so many photo shoots for this book; I think we’re up to six full days of photos and still counting! ), and we’re preparing for a visit from Todd’s parents which will coincide with S’s birthday on Sunday. How can she possibly be turning eleven? She’s more excited about her grandparents’ visit than her birthday, I think, but it’s certain to be a fun celebration. Quite a few of you have been participating in the Gallery Tunic + Dress sew-along, and you’ve been asking great questions. I can’t wait to see how they turn out! Don’t forget to post your photos to enter the contest too, won’t you? In the meantime, I’m off to crawl around on the floor for another couple of days while we finish these photos. Being a photo stylist is exhausting work! Have we already talked about this dress? I think we may have, but I’m posting it again because it’s so good. 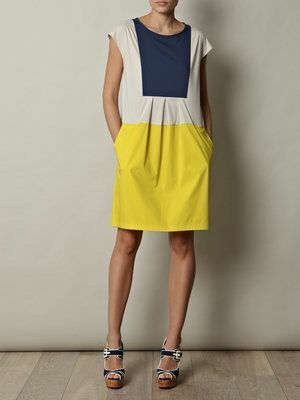 This style reminds me so much of a sleeveless Cinema Dress (or Hide-and-Seek Dress) with color blocking, I love it. And summer isn’t that far away now, is it? As long as we’re talking Hide-and-Seek or Cinema Dresses, what about this one? I love the idea of using a heavily embroidered or very special fabric for just the yoke. The metallic details are just perfect. 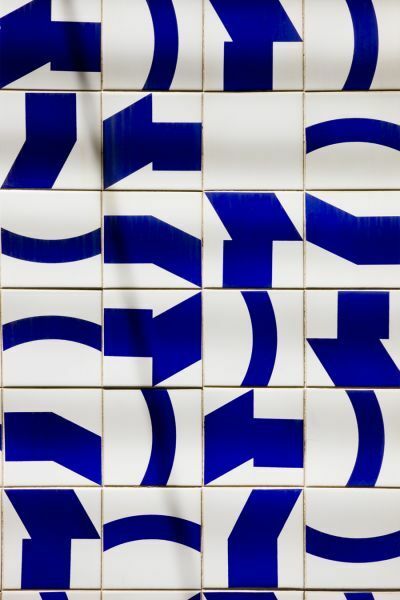 All that Portuguese tile we saw during our trip to Lisbon in December is still on my mind. I love the graphic simplicity of this tile, which would make a gorgeous modern quilt. Actually, it looks like my friend Christopher has been working on something along these lines already! 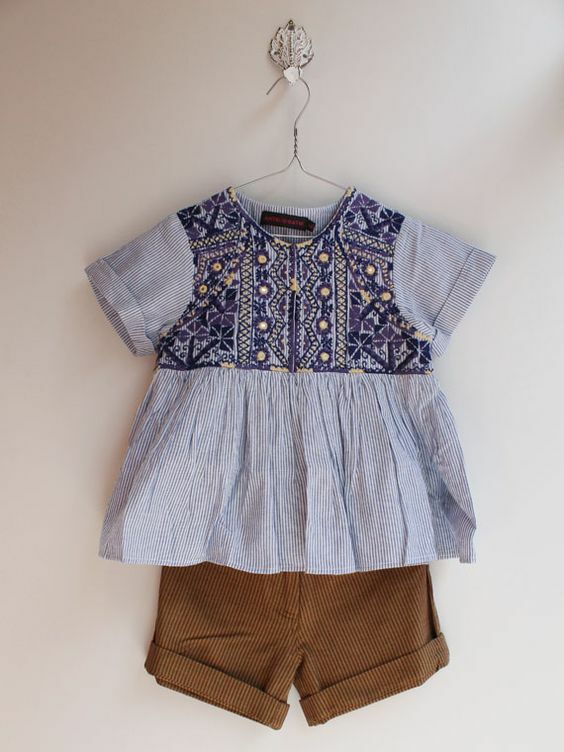 Our Hopscotch Skirt + Top pattern has been a very popular pattern over the years. This style from Boden is similar and could be great inspiration for a spring sewing project. Spanish friends suggested that I watch the TV series Velvet on Netflix to help improve my Spanish. It’s a bit soap-opera-y, but the premise of the show is quite fun. It’s set in 1950’s Madrid (just a few blocks from our apartment!) in a fictional department store that develops its own couture collections in-house. Of course the costumes are great, and the stories are engrossing if you can overlook the occasional melodrama. I won’t say more for fear of spoilers, but once I’ve finished watching all the episodes with English subtitles (on the U.S. site) I plan to go back and watch again with Spanish subtitles (on the Spanish site). That will give me a chance to review some of my favorite dress details, too. I’ve hit pause to study a few of the dresses at length. And since you can’t read subtitles when you’re sewing, here’s a podcast to keep you otherwise occupied during the important parts of the day. Stuff you Missed in History Class is a fun history-based podcast that occasionally includes fashion and fashion history as well as a whole lot of other interesting topics. I especially enjoyed this older podcast about Charles Fredrick Worth and the Birth of Haute Couture. He was quite the innovator, wasn’t he? The Metropolitan Museum’s Costume Institute just opened a new exhibit that looks absolutely fascinating. “Manus x Machina: Fashion in an Age of Technology” highlights the intersection of technology and hand-made clothing. Don’t miss the slideshow! So many great details to examine. When is a spoon not just a spoon? Abby Glassenberg on craft, art, and the difference between the two. OK, have a wonderful weekend! I’ll be back next week to introduce you to my two newest Lisette for Butterick patterns. Can’t wait! Spring sewing, here we come. I bought the pattern to join in on the Gallery Tunic sew a long. And then all 4 of my kids came down with a stomach bug, one after the other, starting on Sunday night. So, all my sewing plans went out the window. Oh well! I hope everyone feels better soon! The sew-along will be up forever, so join in whenever you can. And stay healthy! My Gallery Tunic is done! only the buttons missing. Oh I Ioved Velvet,although I do agree with the excessive melodrama hehe. Is there any american series or movie somehow related to sewing? If you discover any please let us know, Vanahsa! I’m not aware of any but wish there were. I just added Velvet to my Netflix list. I don’t think I ever would have stumbled across that on my own, so, thanks! I hope you’ll enjoy it, Colleen! I just finished the last episode last night and liked how it all wrapped up. Makes me think of House of Eliot… quite the soap opera but fascinating clothing. A fun series. I’m not familiar with that one, Emily! Will go hunt for it. Thanks! Velvet is a bit melodramatic, but the dresses are swoonworthy! ‘El tiempo entre costuras” is great too.